Detail on distribution of artworks in the Tate collection by birthdate of artists, visualized by Florian Krautli. 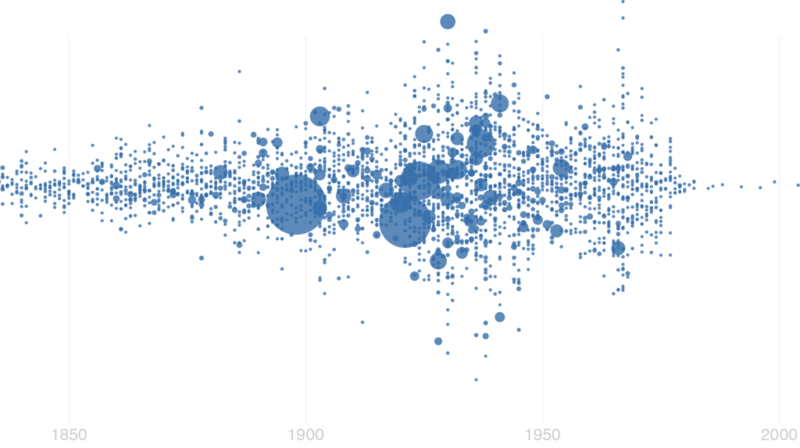 What does "big data" look like for museums? Collecting institutions have enormous stacks of data about the artifacts and artworks in their stores. Several museums around the world have worked hard to make their data accessible by providing free access to datasets, applying Creative Commons licenses to digital content, or creating APIs (application programming interfaces) that allow programmers to build their own software on the museum's data. Last month, the Tate joined the party when they opened up their collection database to the world on GitHub, a website where programmers collaborate on projects. The Tate is providing metadata about artworks and artists in its collection--over 70,000 artworks in all. The data is in a computer language called .JSON that is commonly used for data sharing and processing. Even if you don't speak database, it's worth seeing how the Tate is presenting their collection to programmers on GitHub. Florian Krautli, a Swiss designer living in London, graphed the volume of artworks by individual artists in the Tate's collection over time. Jim Davenport, an astronomer living in Seattle, charted the height and width of all of the works in the Tate's collection. These visualizations are fun. They are beautiful. They raise interesting questions about the Tate's collection and the imperfections of collections data. But the discussions they raise are limited. Florian's blog post centers on the question of why there are so many pieces by William Turner in the Tate's collection. A commenter pointed out that there must be an error in the data, as it is highly unlikely that Turner produced more than 40,000 works in his lifetime. Jim's post suggests some fun but somewhat silly conclusions about the height/width ratio of artworks. It's awesome that data-sharing is causing people to have a conversation about what artists are represented in a museum collection, what kind of artwork the Tate has, what surprising things can be visualized and learned from the collections data, and how the data can be improved. The data is sufficiently flawed and idiosyncratic to yield conclusions of questionable value. Knowing the dimensions of the frame a painting is in is much less compelling than many, many other things that could be known and explored about works of art. I'm imagining visualizations focusing on the gender or race of artists in the collection, frequency of loans (and to whom), frequency of display, common words used in label text... the list goes on. To me, the fact that #1 is exciting and promising makes addressing #2 worth it. Opening up data is just the first (big) step to make it usable and useful. These experiments prompt questions, identify gaps in the data, and promote new forms of collection, dissemination, and analysis. The data you have is not always the data you want, but you often don't know that until you start monkeying with it. Future iterations of data sharing and use will help institutions and citizen-participants take the next steps to make it meaningful. 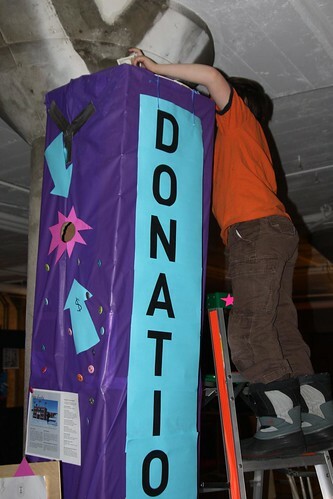 In 2010, the Children's Museum of Tacoma was getting ready to move to a new, bigger facility. Over the years, they had noticed that 50% of their visitors were coming for free or at reduced cost--whether on free days or with special passes. When they moved to the new facility, they decided they wanted to radically expand access to the museum, AND increase revenue. What did they do? They went to a "pay as you will" model. Now, they encourage visitors to become mini-philanthropists, enabling inclusion for all. Charging admission is a means test, and they want everyone to be able to pass. The Children's Museum of Tacoma is two years into their "pay as you will" model, and it looks like a success. Attendance jumped from 40,000 at their old facility to about 120,000 at the new facility. Membership has doubled (now including new perks that extend beyond free admission). Attendance by low-income families is up. And while the average amount paid by each non-member visitor is down (dropping from $6 to about $3), the attendance increase means a net revenue gain. The museum launched this new strategy with a major grant from a funder (Key Bank) that provided five years of admissions offset--enough risk capital to give the museum time to grow into the new approach. The transformation of admission fees and its impact is documented beautifully in this blog post by Jeanne Vergeront. Check it out for a lot more details and numbers. I called the museum because I was curious to learn more about the mechanics of communicating this approach to visitors. "By donation only" can offer a wonderful sense of welcome, or it can be misleading. (Consider the ongoing lawsuits at the Metropolitan Museum on this very issue.) I wondered whether "pay as you will" might come with its own confusion and stress for families without much exposure to museums--the exact people the museum is trying to make welcome. The "pay as you will" messaging is very different, for example, from Mixed Blood Theater's "Radical Hospitality" approach, which emphasizes completely free theater experiences. 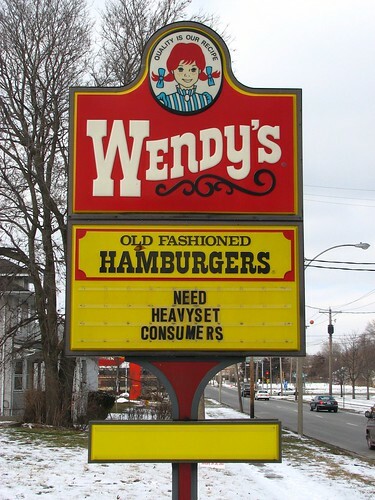 "No cost" is much more clearcut than "pay as you will." Might "pay as you will" become another museum mystery, another source of threshold fear for visitors who don't have a yardstick by which to reasonably guess what they SHOULD pay to visit? They have donation bins throughout the museum, so if people don't want to give much when they first walk in, they can pay somewhere else. Some people will donate more on their way out (but are not prompted to do so). They train their frontline staff to engage with people about WHY it is pay as you will, explaining that your donation makes it possible for other kids who couldn’t afford it, so they can come play for free. Some kids apparently come in with their piggy banks, proud that they can pay to attend the museum--because whatever they have to offer is valued as exactly enough. When people are stressed about how much to pay, he says, "before we went to this model, the cost was about $5 at the door." This might help more literal-minded people feel comfortable with an ambiguous system. To me, this seems like an improvement on the norm... especially in a children's museum, which has a high number of repeat visitors (who can become familiar with the system over time). I can imagine families deciding on a value and paying it fairly consistently with little stress. I can imagine the cute rituals of kids, excited to contribute personally, proud to be part of making the museum available to all. But I can also imagine visitors being confused and stressed out--which is even worse in front of your kids. Does "pay as you will" fundamentally change the relationship between the institution and community members with regard to the cost and perceived value of the experiences inside? There's still a transaction--or at least a conversation--at the gate. Is that a good thing, because it invites/requires people to grapple with the cost of providing these experiences? Or is it just a different wrapper on same old means test? Participation, Contemplation, and the Complexity of "And"
"The words we use in attempting to change museum directions matter. We need translators within each cultural context. We do not yet have precise words or even uniform understanding of the words we use. But we do have 'and.' And a good thing, too." 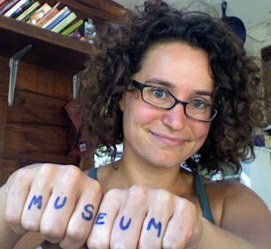 --Elaine Heumann Gurian, The Importance of "And"
Recently, I've been embroiled in local and national conversations about the relationship between active participation and quiet contemplation in museums. 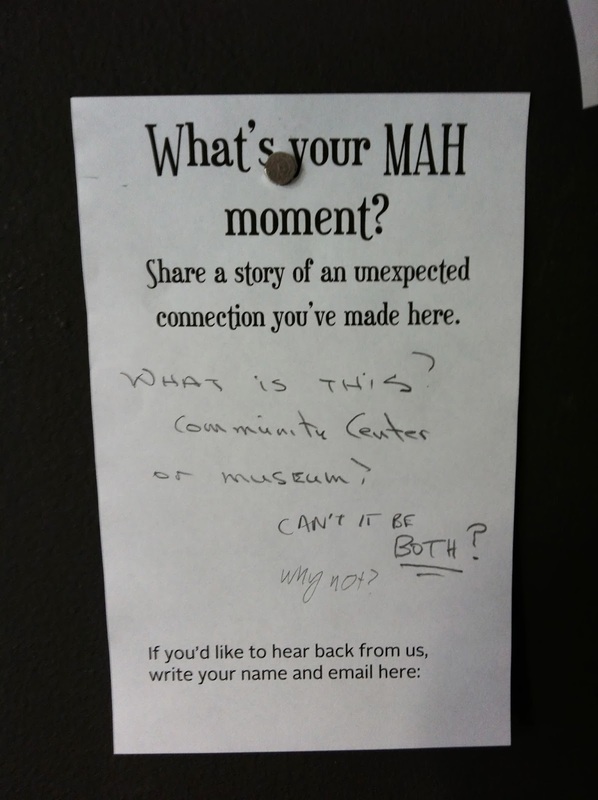 Our museum in Santa Cruz has been slammed by those who believe participatory experiences have gone too far. It has been championed as a site of courageous experimentation. It has been challenged for our community-centered approach. I joined the dialogue this weekend with an op-ed echoing Elaine Heumann Gurian's powerful call for the "museum of 'and'" - a museum that includes and values multiple experiences and approaches. Each of these articles--and the comments around them--are fascinating artifacts of a debate that has been behind the scenes for too long. I am glad this conversation is happening and that both museum professionals and local Santa Cruzans are engaged. We always knew that the inclusion of participatory and community-centered practices in arts institutions was controversial. But this is a rare moment when that controversy has come directly to the surface. It's a unique opportunity to learn from people with different perspectives. To me, the backlash against participatory and community-centered experiences is not surprising. I've always understood that participatory experiences are not for everyone. I've always known that some people feel that social work means mission creep for museums. What surprises me is the argument that participatory and community-centered initiatives, offered alongside many other interpretative strategies, program types, and projects, can erode the value of an institution and the experiences it provides. Like many of our supporters, I am perplexed as to why critics claim we have thrown tradition out the window when, from my perspective, we have simply added new opportunities alongside a strong commitment to traditional practice. We know most visitors use only a small percentage of the programming and interpretative elements that museums provide. Some people commune with the art. Some visit the archives. Some come to family festivals. Why should a comment wall in an exhibition be more threatening than a label? Why is a crowded Friday night event in conflict with a quiet Saturday in the galleries? Why should any one type of experience in the museum have veto power over others? I have wrestled with these questions over the past six weeks. In doing so, I've come to believe that the fundamental issue here has little to do with participation. It's about the complexity of "and." The more "and" we integrate into the MAH, the more people value the museum as a catalyst for meaning-making, creative expression, and civic participation. Value is reflected in the diversity of the people who participate, the power of the experiences we offer, and their ripple effects throughout the county. The stronger our value, the stronger our finances, the stronger our ability to expand all our offerings -- the contemplative AND the participatory. But "and" is not an easy mandate to carry out. It requires balancing priorities, embracing creative tension, including diverse voices, and staying true to our mission as we explore new opportunities. Defining the limits. One could imagine applying the principle of "and" willy-nilly to justify any outgrowth. One commenter on my op-ed, referencing the idea of our organization as museum "and" community center, asked: "If diversity is the goal, why not also make MAH part skate board park and off leash dog area?" The answer to this question comes back to the strategic vision for the organization. Our museum's vision statement begins with the phrase, "The Museum of Art & History is a thriving central gathering place...". This framing suggests a community-centered approach in which the museum brings people together around art and history. If our vision statement started with a phrase like " The Museum is a cutting-edge research facility..." that would imply a different set of appropriate activities, approaches, and limits. We are rigorous internally about tying our mission and vision to specific programmatic strategies and goals for different program areas. Those goals form the constraints for our approach to "and," allowing us to say yes with confidence to some opportunities and reject others. Time: 90% of our open hours are daytime hours when people can explore exhibitions in peace and quiet. The other 10% are primarily Friday nights when we offer hands-on, social event-based programming that tend to be crowded and lively. Space: During daytime hours, approximately 15% of our exhibition galleries offer participatory experiences. During community programs, that number jumps to 95%. Our building is about half galleries, half public spaces. The public areas include both participatory and traditional content but are dominated by open space and seating. Staffing: We have 2.25 full-time equivalent staff members devoted to exhibitions and collections, 2.5 devoted to community programs. Money: We spent $287,000 last year on exhibitions and collections, $179,000 on community programs. Both of these figures represent increases over the previous year. Looking at all of these bullets, how would you assess the relative number of resources devoted to participation and contemplation? How would you decide where to put more resources? How would you decide who is underserved and who is overserved? Our strategy is not to try to perfectly balance the teeter-totter of resources but to develop the most generative combination. We do that through a structure that emphasizes cross-functional job descriptions, a program development strategy in which exhibitions and events build on each other, and an evaluative eye on how our mission and goals are manifest across diverse projects. Messaging. Perhaps the biggest challenge to "and" thinking is the way that our organization presents itself and is presented in the media. We have a big banner outside our building that says PARTICIPATE. We do not have a comparable one that says CONTEMPLATE. Almost every article about our museum casts the institution as one that has gone through radical change. We issue press releases for everything we do, but the stories that get picked up tend to be about new programs and approaches. People talk about the museum in terms of then and now, old versus new. In some ways, this makes sense. We want to welcome in people who may have felt excluded by traditional museums, so we over-communicate a sense of openness, inclusion, and active participation. The press loves novelty. People who get involved are passionate about what's new. People who feel less connected focus on what they lost. A detractor says our museum has "gone to hell." A supporter responds, "Gone to hell? More like back from the dead." Both of these perspectives represent "or" thinking. The reality is that we have made the museum more vibrant by adding, not replacing. But it can feel like more dramatic change because the new additions get the lion's share of the ink and the oxygen. Is it possible to have a brand that represents the totality of the diverse experiences offered by one institution? Probably not. It's both impractical and strategically undesirable to try to present a museum as all things to all people. Each visit is a single data point in a constellation of diverse experiences and offerings. While our staff and our most engaged participants perceive the diversity of the blend over the course of the year, most people only attend once or twice and form an impression based on those singular experiences--or on what they read in the paper. To teachers we are an educational facility. To historians we are a research facility. To art-lovers we are an exhibiting facility. To crafters we are a making facility. And so on. As a museum with a mission to "ignite shared experiences and unexpected connections," it is our challenge to make the "and" more overt, to help people see the bridges between the experiences they currently enjoy and unfamiliar ones that might open up new opportunities for them. In the same way that we focus on social bridging--bringing people together across difference--we are also increasingly focused on programmatic bridging--bringing museum experiences together across program areas and audiences. We may never be seen entirely as a museum of "and." But we can do our best to be that kind of institution and hope that the message shines through.